Balda was a German camera maker based in Laubegast, near Dresden, founded in 1908 by Max Baldeweg and started by manufacturing shutters, film-pack holders and self-timers. The factory was renamed as Balda-Werk Max Baldeweg in 1913. Balda made a quantity of medium-priced folders before World War II, and its camera production was quite comparable to Welta or Certo, though Baldas as a rule sold for lower prices than either of those cameras. One originality of Balda was to sell cameras to many other companies for resale under their own brand (today this would be called OEM). Perhaps as part of this strategy, Balda cameras were fitted with a very wide range lenses, from the low cost self-branded triplets through Meyers and Ludwigs, to the high end Schneider Xenars and Xenons, and Zeiss Tessars and Biotars. After WWII, Balda was nationalized in East Germany in 1946, while its founder Max Baldeweg fled to West Germany to start Balda-Werk Bünde. The East German plant began to make own Ovus shutters which were no Compur clones but had all the functions of the West-German Compur shutter. The Cludor and Vebur shutters were derived from the Ovus. In 1950 Zeiss Ikon took over the production of the shutters. After trademark litigation similar to that involving the Carl Zeiss and Zeiss Ikon companies, the name of the East German company was changed to Belca-Werk in 1951. It continued for some time to produce folders like the little 35mm Beltica, and was absorbed into VEB Kamera-Werke Niedersedlitz in 1956. In the West, Max Baldeweg set up a new company called Balda (Balda Kamera-Werk), this time based in Bünde, West Germany. 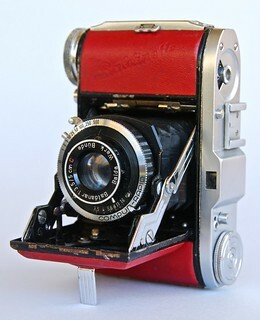 This company produced a series of 35mm and medium-format rollfilm cameras, some of them being sold by Porst under the Hapo brand or by Foto-Quelle under the Revue brand. In the 1970s, market was becoming more and more dominated by the Japanese cameras; Balda progresively discontinued production of their own cameras, which were reduced to compact cameras for 126 or 110 cartridge film, then mostly manufacturing cameras on commission from other companies. Balda still exists today manufacturing plastic pieces, although production was outsourced to China and the old factory was sold in 2001. ↑ See this page at dresdner-kameras.de. ↑ See the KW section at dresdner-kameras.de. ↑ Balda made the C*35 series (aka Voigtlander Vito - Minox 35 clones) in the 1980s. This page was last edited on 21 December 2018, at 15:09.